Cannot be Normal Summoned/Set. Must be Special Summoned (from your hand) by banishing all LIGHT Machine monsters from your field and GY. This card's ATK/DEF become the number of monsters banished for its Special Summon x 500. When this card is Special Summoned: Send all other face-up monsters on the field to the GY. This card appears in the artwork of Cyber Network. Eltanin, also called Gamma Draconis, is the brightest star in the constellation Draco. The name comes from al-Tinnīn (التنين), The Dragon, which is the Arabic name of the constellation. The Arabic name of the star itself is Ra’s al-Tinnīn (رأس التنين), The Dragon's Head. 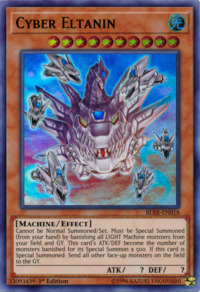 This card can be seen as the LIGHT version of Chimeratech Overdragon or Chimeratech Fortress Dragon. This card's Summoning requirements, its multiple heads, as well as the fact that it gains ATK based on the number of monsters it banished, are reminiscent of Evil Dragon Ananta. The main head for Cyber Eltanin looks a lot like the Mechagodzilla from Godzilla Tokyo SOS, while the smaller heads look more like the original Mechagodzilla. The main head is also similar to the Ersatz head from the card Wicked Dragon with the Ersatz Head. The highest ATK that can be gained from this card's own effect is 37000; that is with 59 cards from the Main Deck and 15 cards from the Extra Deck. Additionally, if the opponent uses 5 effects that causes their monsters to move to your side of the field, you can potentially have 5 of your opponent's LIGHT Machine-type monsters on your side of the field to banish for Cyber Eltanin. While unlikely, this raises the highest possible ATK that can be gained from this card's own effect to 39500. When Special Summoning "Cyber Eltanin", only monsters which are both LIGHT-Attribute and Machine-Type are removed from play. The original ATK of "Cyber Eltanin" is treated as 0 while it is on the field. Thus, if it is equipped with "Megamorph", then "Cyber Eltanin" will have 0 ATK. When the effect of "Megamorph" is no longer applied, the ATK of "Cyber Eltanin" returns to 500x the number of monsters removed from play to Special Summon "Cyber Eltanin". : What is the ATK of "Cyber Eltanin" when it is equipped with "Megamorph"? If "Cyber Eltanin" is flipped face-down by an effect like "Book of Moon", then its effect of increasing its ATK is no longer applied. If "Cyber Eltanin" is later flipped face-up, then its ATK will be 0.: What happens to the ATK of "Cyber Eltanin" when it is flipped face-down or when its effect is negated? If "Cyber Eltanin" is affected by "Skill Drain", then its effect of increasing its ATK is no longer applied, so it will have 0 ATK. If the effect of "Skill Drain" disappears, then the ATK of "Cyber Eltanin" will remain at 0. When Summoning "Cyber Eltanin", when removing from play LIGHT Machine-Type monsters on your side of the field, you only remove from play monsters that are face-up. If a LIGHT Machine-Type monster is face-down, then it is not removed from play. : Are face-down LIGHT Machine-Type monsters also removed from play when Summoning "Cyber Eltanin"? When Summoning "Cyber Eltanin", LIGHT Machine-Type Token Monster are also removed from play. You may Special Summon "Cyber Eltanin" if the only LIGHT Machine-Type monsters are Token Monster on your side of the field. Token Monsters removed from play to Special Summon "Cyber Eltanin" will be counted and will contribute 500 ATK and DEF each. : Are LIGHT Machine-Type monsters removed from play when Special Summoning "Cyber Eltanin"? 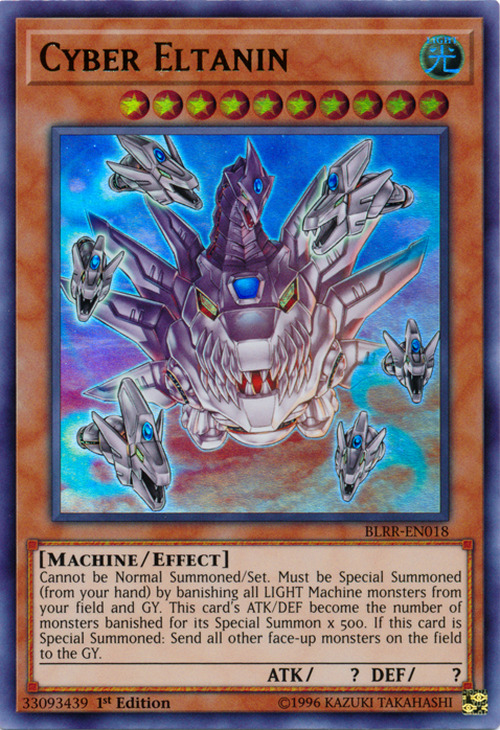 You can Special Summon "Cyber Eltanin" by only removing from play all LIGHT Machine-Type monsters from your field if you do not have any in your Graveyard, or by only removing from play all LIGHT Machine-Type monsters from your Graveyard if you do not have any on your side of the field. : Can "Cyber Eltanin" be Special Summoned while there are not LIGHT Machine-Type monsters in your Graveyard or on your Field?